An increase in attacks by Boko Haram and uncontrolled reprisals by Nigeria's security forces has seen the death toll in North East Nigeria rise to at least 1,500 people, more than half of whom are civilians, in the first three months of 2014, Amnesty International said in a briefing published today. 'The escalation of violence in north eastern Nigeria in 2014 has developed into a situation of non-international armed conflict in which all parties are violating international humanitarian law. We urge the international community to ensure prompt, independent investigations into acts that may constitute war crimes and crimes against humanity,' said Netsanet Belay, Research and Advocacy Director for Africa at Amnesty International. More than half of the killings have been carried out by members of the Islamist armed group Boko Haram, including scores of schoolchildren who have been the victims of deliberate attacks. Amnesty International has documented the killings carried out in January, February and March 2014 by both Boko Haram and the Nigerian Security Forces. It highlights 14 March as a tipping point when the security forces unleashed a brutal crackdown on former detainees. On 14 March Boko Haram gunmen attacked the Giwa military barracks in Maiduguri, Borno state. They reportedly fought their way into the detention facilities and freed several hundred detainees. Amnesty International has received credible evidence that as the military regained control, more than 600 people, mostly unarmed recaptured detainees, were extra-judicially executed in various locations across Maiduguri. Amnesty International has pieced together a partial timeline of events following the 14 March attack in Maiduguri. The evidence is based on interviews with residents, lawyers, human rights campaigners, and hospital staff across the city as well as satellite imagery showing three possible mass graves in one area of Maiduguri. 'The scale of atrocities carried out by Boko Haram is truly shocking creating a climate of fear and insecurity. But this cannot be used to justify the brutality of the response that is clearly being meted out by the Nigerian security forces,' said Netsanet Belay. Amongst the testimony gathered by Amnesty International were the voices of witnesses who described what happened when the military found 56 of those who had escaped from the Giwa barracks. Other eyewitnesses in Jiddari Polo, also in Maiduguri, described how members of the 'Civilian Joint Task Force' rounded up freed prisoners and handed them to soldiers. More than 190 people were executed, many of whom were too frail to run. Given Nigeria's apparent unwillingness and inability to investigate and prosecute perpetrators of these crimes, Amnesty International is calling on the African Comission and the United Nations to assist Nigeria in investigating acts that may amount to war crimes and crimes against humanity committed by both Boko Haram and the Nigerian security forces in north-eastern Nigeria. 'The summary killing of these detainees amount to extrajudicial executions and are crimes under international law. These killings follow an entrenched pattern of deaths in custody of detainees held in relation to the situation in the northeast,' said Netsanet Belay. Amnesty International is also calling on the African Union (AU), the Economic Community of West African States (ECOWAS) and the African Union's Peace and Security Council to assess immediately the conflict situation in north-eastern Nigeria and provide full and effective support to end these acts of violence against civilians. It must also strongly condemn the on-going war crimes and crimes against humanity committed by all parties to the conflict. 'As Nigeria assumes the chairmanship of the African Union's Peace and Security Council next month, the AU needs to critically ask itself how far its member States are living up to their commitment to uphold the principles of the African Union and respect for rule of law and human rights,' said Netsanet Belay. · Video and photos available: Independent video footage of a soldier dragging a young man down the street in Maiduguri, before shooting him point blank is available for use. His corpse was left with a pile of dead bodies in the middle of the road. · The 'Civilian Joint Task Force' (JTF) is made up of loosely organised vigilantes and was set up in 2013 in Maiduguri, Borno state to work with the Nigerian security forces to restore normalcy to the state. Their primary responsibility, according to security and government officials, is to identify and help arrest suspected Boko Haram members. There are consistent reports of human rights abuses by the Civilian JTF. The name 'Civilian JTF' is being used to show the association between the JTF (comprising the Nigerian army, Police and State Security Services) and the civilians who have volunteered to serve as vigilantes in the fight against Boko Haram in Borno state. · AU Peace and Security Council: According to the Rules of Procedure of the AU Peace and Security Council, the chair of the Council is held on a rotating basis by one elected member state of the council for one calendar month. Mozambique was the chair of the council for the month of March and this is to be transferred to Nigeria on 1 April. Nigeria is a critical player in the peace and security affairs of the African Union. · Deaths in military custody: In October 2013, Amnesty International called on the Nigerian government to investigate the deaths of more than 950 people in military custody in north eastern Nigeria. Amnesty International is still receiving credible evidence that detainees continue to die in large numbers while in military custody. Since January 2014, approximately 150 dead bodies have been brought by the military to the State Specialist hospital mortuary. · In the last two weeks of March, the JTF has attacked Boko Haram camps in Borno State around Lake Chad, the Sambisa Forest and the Mandara Mountains. Reports in the Nigerian media indicate that hundreds of corpses have been seen transported away from those areas by military personnel. No precise figures have been received from the military. The camps attacked include Gombole, Mele, Kecheri, Dufrfada, Yuwe, Duguri, Polkime and Malafatori, among others. · 24 March: Members of the JTF killed 18 suspected Boko Haram members on as they prepared to attack Bama and Ngurosoye towns. · 20 March: an improvised explosive devise detonated in a market in Ngurosoye village killing at least 16 people. Boko Haram is suspected of carrying out the attack. On the same day the military allegedly bombed Kayamla village, killing 10 residents. · 14 March: Boko Haram attacked Giwa barracks in Maiduguri, allegedly freeing hundreds detainees. There were no reported deaths of soldiers in the attack. A couple of hours later, the military regained control of the barracks. More than 600 people, mainly former detainees, were killed in the attack and its aftermath. · 9 March: sources in Nigeria's military claimed to have killed over 210 Boko Haram members in raids on Boko Haram camps in the Sambisa forest, Borno State. · 3 March: suspected Boko Haram members attacked Jakana Village in the Konduga Local Government Area of Borno State. They killed between 40 and 48 civilians, and destroyed shops and the police station. 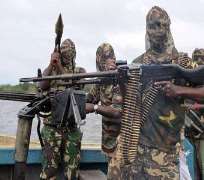 · 2 March: Mafa village in Borno State was reportedly attacked by suspected Boko Haram gunmen. They killed 29 people and destroyed several houses. A bomb left by the attackers was said to have detonated later, killing two police officers. Allegedly, the JTF of the Nigerian security forces did not respond for five hours after the attack. · 1 March: 39 people were reportedly killed in an attack on Mainok village, Borno State by suspected Boko Haram members. Several houses were also burned down during the attack. Earlier in the week, the JTF ambushed Boko Haram members as they prepared to attack Mainok village, killing 40 insurgents. · 1 March: two bombs were detonated in Maiduguri, Borno State, killing 52 people. Boko Haram members were alleged to be responsible. · 26 February: suspected Boko Haram gunmen killed 37 people in attacks on Kirchinga, Michika and Shuwa villages in Adamawa State. During the attack on Shuwa village, assailants burned down a Christian college and school. Military sources claimed to have killed six suspected Boko Haram members during their counter-attack. · 25 February: between 43 and 59 people were shot dead by suspected Boko Haram members in an attack on a school in Buni Yadi, Yobe State. Many school children were among those killed in the attack. According to residents, the military did not respond during the attack, which lasted between four and five hours. · 19 February: suspected Boko Haram gunmen attacked the palace of a traditional leader and a school in Bama, Borno State in the early hours. Between 60 and 90 people died. The assailants allegedly used suicide bombers and improvised explosive devises. The military claimed that they killed 'a lot of insurgents' during the confrontation. · 16 February: several villages in Adamawa State were attacked by Boko Haram members. 65 people died in the attacks. · 11 February: an attack by suspected Boko Haram members left more than 50 people dead in Konduga town, Borno state. The attackers also reportedly burnt many houses, shops and vehicles, and abducted an unconfirmed number of people. · 26 January: Boko Haram members attacked Kawuri village, Borno State, killing between 52 and 85 people, and destroying the village market. · 26 January: in Adamawa State, gunmen suspected of being Boko Haram members attacked a church in Waga Chakawa Village. Between 31 and 47 people were reportedly killed in the attack, including two policemen. · 19 January: suspected Boko Haram gunmen attacked the village of Alau Ngawo Fatie, Borno State, killing 18 people and causing many other residents to flee. · 14 January: a car bomb exploded in Maiduguri, Borno State, killing as many as 43 people and injuring many others. Boko Haram are suspected to be responsible.